The Upper Snake River begins as a series of small streams draining valleys deep in the backcountry of Yellowstone National Park and the Teton Wilderness. Throughout the Teton Wilderness and the southeast portion of Yellowstone National Park exists an almost impenetrable puzzle of valleys and ridges, each acting as its own drainage basin. From its point of origination in the Teton Wilderness, the Snake River runs toward the west along the southern border of Yellowstone National Park, picking up the Heart River from Heart Lake, the Lewis River from Lewis Lake, and several other smaller tributaries. The Snake River looks much more like a classic freestone stream. Those characteristics that define freestone streams- fast currents, braided channels, variable seasonal flows, heavy stream-bound structure, and a plethora of tributaries- are more than apparent. As it flows through Jackson Hole and the Snake River Canyon, the river drops an average of 16 feet per mile. The massive basin it drains contains mountains that stand well over 13,000 feet in elevation. The dramatic landscape surrounding the Snake River in Jackson Hole is the result of millions of years of tectonic and glacial activity. 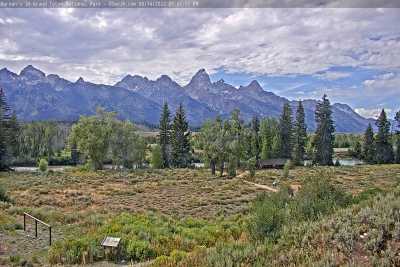 The Teton Range, to the west of the Snake River, began to rise from the valley floor between 30 and 35 million years ago, and only within the past nine million years have these peaks made their most dramatic upward thrust. Two tectonic plates, one making up the valley floor and the other the Teton Range, lay against each other on a fault line running in a north-south direction. The valley pate extends eastward in an uplifting action. The effect is a constantly sinking valley and a constantly rising mountain range. In other words… the Tetons are still growing. A series of glaciers have covered Jackson Hole over the past 2 million years, helping to create large alpine lakes along the Teton Range as well as several buttes dotting the valley. Over several thousand years, the river has eroded its own path through the glacial outwash plain that makes up the valley floor. The result of the glacial movements is a deep, dramatic, and quite beautiful canyon.